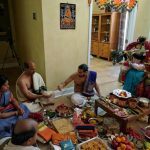 Atlanta GOD Satsang members were invited by Ahobilam Mutt to do Namasankirtanam on Saturday, March 2nd 2013. 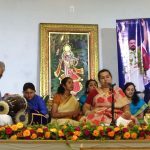 The satsang commenced with Nama Sankirtan for 15 minutes and was followed by a Madhuragitam session.Around 60 people participated and enjoyed the satsang. 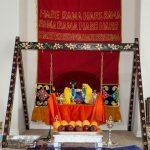 The session was initially planned for half hour, but since the audience really enjoyed the session and expressed interest to listen to more kirtans, the satsang continued for one and half hour. 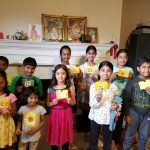 Many parents were interested to learn the kirtans composed by Sri Swamiji and GOD Atlanta chapter has started bhajan classes for seven kids through Skype.